If the NDSU women’s basketball team wanted any momentum heading into the Summit League Championships, they needed to improve on a 1-14 record away from Fargo. While that record was not improved, there are still some positives to take away heading to Sioux Falls. A 71-64 loss at Oral Roberts may not look great on paper, but was one of the best performances in 2017 for the Bison. NDSU won most of the statistical battles. The 49 percent shooting from the field made it one of the most productive games of the season. Brianna Jones led the scoring with 16 points. Taylor Thunstedt added another 11. The Bison also matched ORU’s total of 38 rebounds, as the two teams were tight throughout the first half. The Golden Eagles pulled away in the third quarter. NDSU was held scoreless for over three minutes in the middle of the quarter. ORU’s Lakota Beatty connected on three three-pointers as the Golden Eagles outscored NDSU 25-11 in the frame. The good news for the Bison came in the fourth, as they rallied back. The Bison had a 21-14 edge in the fourth. Jones had eight points late in the game as NDSU brought a once 20-point deficit back to just six. There is one big issue that still vexes the Bison, and that is limiting turnovers. ORU turned the 21 NDSU turnovers into 25 points. Just Emily Spier and Autumn Ogden had more assists than turnovers. That will be the issue that the Bison will need to fix, as they will take the No. 7 seed to take on IUPUI. The Jaguars beat the Bison 76-53 last week in Fargo. The positive fight back on Saturday came on the heels of what is a common loss for the Bison. NDSU went on the road to Omaha, where they were dispatched 90-64. The Mavericks got off to the better start, and never looked back. Omaha led 10-2 early after a pair of Michaela Dapprich three-pointers. Omaha was solid all night, shooting 54 percent from the field and 52 from three. Dapprich led all scorers with 23 on the night. For the Bison, it was Kennedy Childers leading the way. The sophomore finished 17 points, just shy of a career high. NDSU was bullied in the paint, giving up 38 points down low to the Mavericks. Turnovers were not the problem for the Bison, as they only committed 10. The issue on Wednesday night was the three-point shooting. 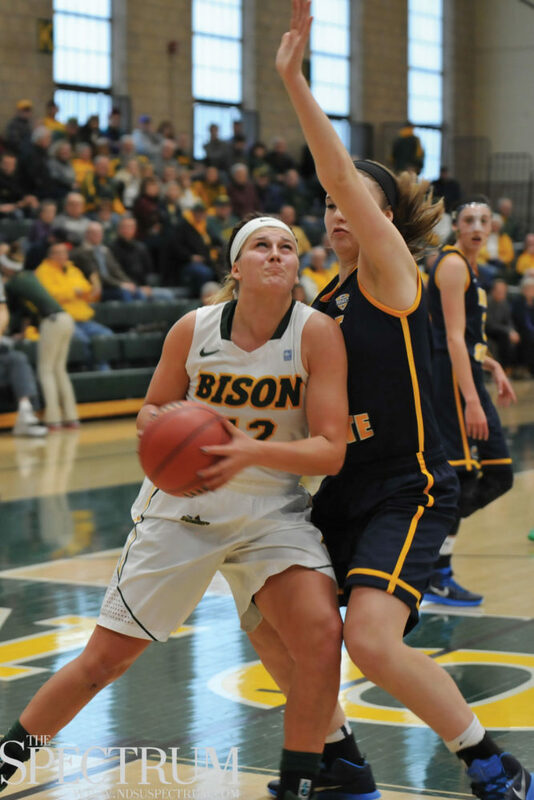 The Bison were just 24 percent from range, as Thunstedt and Sarah Jacobson combined for 1-13. NDSU finishes the regular season at 6-23 overall (4-12 Summit League). The Bison will now have to look for just a second win away from home. To compound issues, the Bison have just one win over the high seeds in the tournament. The Summit League Championships kick off on Saturday. No. 7 NDSU will play No. 2 IUPUI at 2:30 p.m. from the Denny Sanford Premier Center in Sioux Falls, S.D. The Winner will play the winner of No. 3 South Dakota State and No. 6 Oral Roberts on Monday.